On April 29, 2017, I joined the People’s Climate March. People took to the streets around the world to raise a stronger sense of urgency to act against climate change. The date coincided with Donald Trump’s 100th day in office. 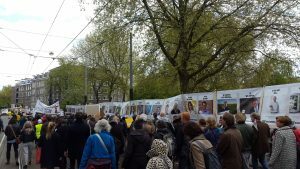 I joined the Amsterdam climate march, along with 8000 others. With a very specific local goal to urge the negotiators shaping the new government in the Netherlands to integrate climate policy into their plans. 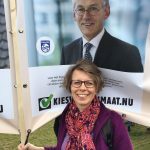 For most of the climate march, I carried part of a 50-meter banner created by Urgenda, a local initiative aiming for a fast transition towards a sustainable society, focussing on a circular economy and renewable energy. The banner pictures CEOs, policymakers, civil society leaders, and other people acting on climate change already, and in support of clear climate policy. Interesting to be part of such a march again. I last took to the street with a banner decades ago! What really struck me was the diversity of people joining the climate march. As individuals or as part of specific groups. 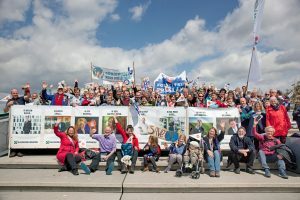 The group I joined was actually a reunion for people who joined Urgenda’s founder, Marjan Minnesma, for part of her walk to the Paris climate conference in 2015. Already within this group, there was rich diversity, walking together for positive change. After a while, I stepped out of the flow of the climate march and sat down. Thousands of people walked by. Quite impressive to see anti-globalists march together with business representatives and politicians, vegans with an action group linking refugees to climate change, and many, many more. Every once in a while, I would step back in to walk with people I knew. Like Marjan Minnesma, Marloes Arkesteijn, Kees van der Leun, Caroline van Leenders, and Miriam van Gool. And I walked quite some miles with people I did not yet know. So powerful to experience what a shared sense of purpose – and physical movement in the same direction – can do to unite us. 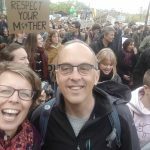 Joining the climate march created new connections and strengthened my personal conviction to drive positive change. And I trust it has not just had this effect on me. Yet on many of the hundreds of thousands of people who marched around the world. And I truly hope that it also drives positive change by many who were not there, creating a powerful movement so strong, that it can’t be stopped. Yet with the intent to stop something so detrimental to humanity: ignoring the reality of climate change. Written by Marjolein Baghuis (@mbaghuis) for Change in Context. To read about interesting people, book reviews and other posts about sustainability, change, and communications please subscribe to the Change in Context blog.